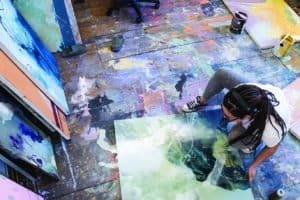 A Saint Rose degree in Studio Arts (BS or BFA), or Graphic Design (BFA) will provide you with the skills and experience you need to create a future of personal satisfaction and professional success. The Center for Art & Design programs and faculty will challenge you to forge your own creative path. The Portfolio Review is a required part of the application process for students wishing to major in one of the aforementioned degrees. The Center for Art & Design faculty host Portfolio Review days throughout the fall and spring for prospective and current students. Register for a Portfolio Review and tour the Center for Art & Design facilities (including the NEW Massry Center for the Arts), interact with faculty and share your work, your ideas and your aspirations. Click here for our Events Calendar to choose from the dates below, and have your portfolio reviewed ASAP!